How to secure nutrients remaining on the agricultural field rather being washed out to surface waterbodies? 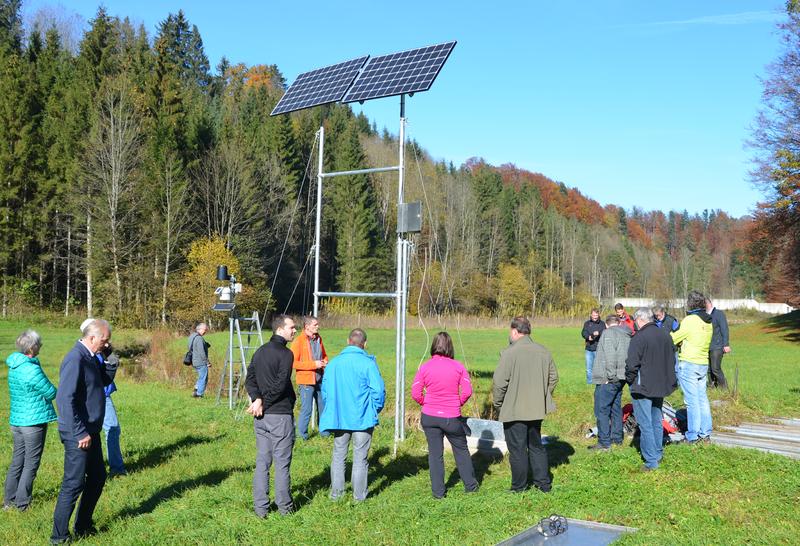 Collaborators from the Department of Geography and Geology at the University of Salzburg and about 20 experts on water protection and farming from the regional governments of Salzburg and Upper Austria discussed environmental pollution during the snow melting period and extreme rainfall events. 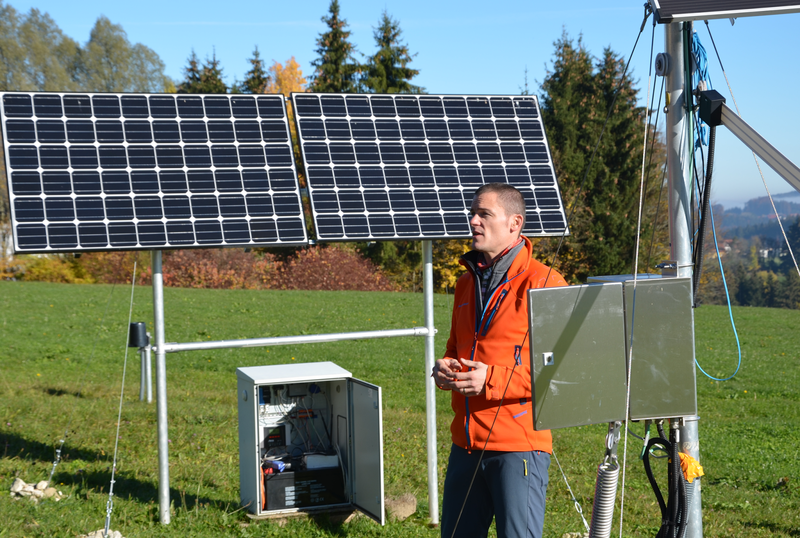 Hermann Klug, project leader of the Z_GIS Landscape Lab in Koppl close to Salzburg, provided a guided tour through the landscape lab. Automatically informing farmers before an extreme rainfall event would prevent applied liquid fertilizers being washed out during the event. At the station Plainfelderbach Hermann Klug demonstrated an applied method for detecting phosphorus concentrations in the river. Measurements were triggered using real-time information from a rainfall sensor installed next to the station. Computer driven interaction between human and the phosphorus analyzer also allow the determination of measurements for certain time periods. They were the youngest speakers at the 2015 ESRI European User Conference: four young people presenting the YouthMap5020 to the audience. And they did a great job in showing their own achievements. Hundreds of young people had contributed to the map. It includes special information for young people such as skate parks, chill out places and much more. 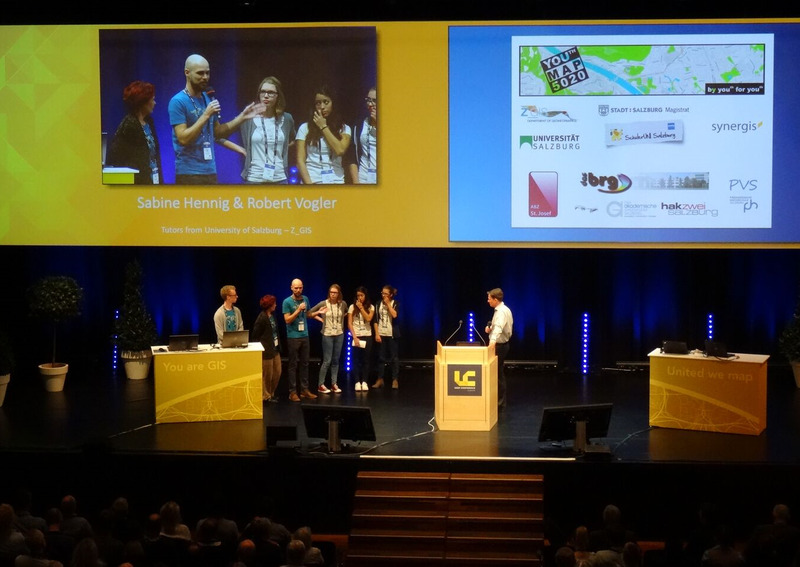 Also on stage: project leaders Sabine Hennig and Robert Vogler (both Z_GIS), who had initiated the project in 2013. Z_GIS is one of the winners of the Copernicus Masters 2015! The prize was awarded to Dirk Tiede from Z_GIS at the Awards Ceremony in Berlin on October 20. Congratulations to the laureates Dirk Tiede, Andrea Baraldi, Stefan Lang, Mariana Belgiu and Martin Sudmanns. Z_GIS is this year's winner of the T-SYSTEMS BIG DATA CHALLENGE implementing a service idea during a four-week sandbox exercise. The award-winning idea is a real-time image analysis & querying system called ImageQuerying (IQ). IQ is an innovative near real-time image understanding and querying system for big Earth data. 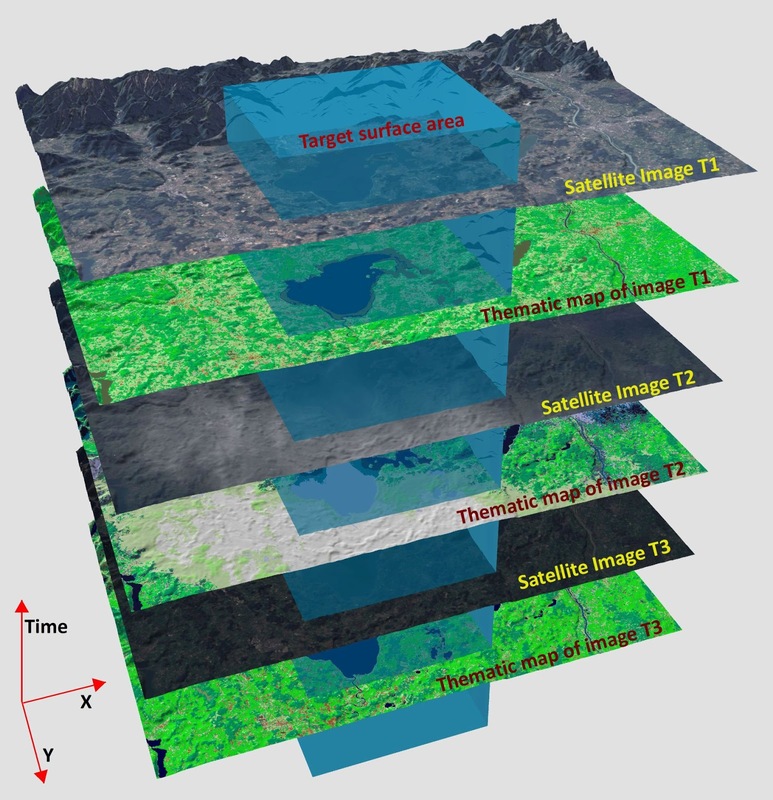 Built upon an expert system for low-level computer vision, IQ provides each image stored in the database with at least one (or more) fully automatic generated thematic map(s). Image objects can be tracked by the IQ inference engine through time, resembling symbolic human reasoning. Information layers can be generated by users interactively by querying and combining thematic maps stored in the underlying database. This work was supported by the Austrian Research Promotion Agency (FFG) as part of the project AutoSentinel 2/3, ID 848009. 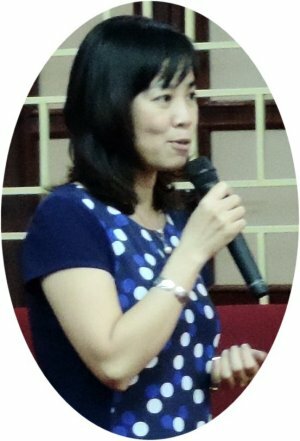 Successful completion of 'civil-GIS' workshop in Vietnam! The Department of Geoinformatics - Z_GIS concluded a week-long international capacity building workshop on 'GIScience for Civil Protection Management in Southeast Asia (civil-GIS)' at the University of Transport and Communications (UTC), Hanoi, Vietnam. The workshop was organised jointly by Z_GIS and the Faculty of Civil Engineering (FCE), UTC from 5th to 9st October, 2015 followed by a field excursion on 10th October. The civil-GIS project was co-funded by ASEA Uninet, Austria. Dr. Shahnawaz (Z_GIS) and Dr. Thi Lan Huong HO (Vice Dean, FCE) conducted the workshop at UTC. Prof. Dac Su Tran (Rector, UTC) and Prof. Ha Phi THAI (Director International Relations, UTC) inaugurated the workshop. The logistical organisation of the workshop was intensively supported by Mr. Khanh Giang LE and International Relations Office of UTC. Focusing on interdisciplinary faculty development, 31 teachers and postgraduate students from 12 universities in 5 countries (i.e. Indonesia, Malaysia, Philippines, Thailand and Vietnam) participated in the workshop. The participants worked on individual projects covering a range of aspects related to civil-protection in Southeast Asia using ArcGIS Desktop and ENVI software, and presented the outcomes in the concluding session. Prof. Ngoc Long NGUYEN (Vice Rector, UTC) and Dr. Thi Lan Huong HO conferred the certificates of successful completion on the workshop participants and congratulated them for having benefited from this international workshop. Both the high level university officials conveyed their thankfulness to Z_GIS as well as to ASEA Uninet, Austria and expressed their willingness to host anther such workshop either in Hanoi or at the UTC campus in Ho Chi Minh City in the near future. Over the last five years Diana Contreras developed new measures based on remote sensing and GIS for the monitoring of recovery processes after disasters and successfully defended her Thesis “Spatial indicators of recovery after Earthquakes". The methodology was developed for the case of the Italian city of L’Aquila, which was struck by an earthquake in 2009. For l’Aquila, she could prove that the construction of new houses and their location and their connectedness to the city center is a major factor for the satisfaction of the residents. The indicators developed physical aspects and socio-economic aspects while the spatial dimension is the connector of the variety of indicators used. We wish Diana all the best for her future career.